I aspire to host fabulous events like those my Great Aunt Jerry hosts every single Holiday. Oh, how I just love planning menus for parties, events, date nights, Tuesdays…. I’ll take basically any excuse to plan a menu- from simple to elaborate, I’m all over it. Living in Canada, we have our Thanksgiving in early October so when American Thanksgiving rolls around it’s rather anticlimactic for me personally. Obviously, that doesn’t deter me from celebrating. 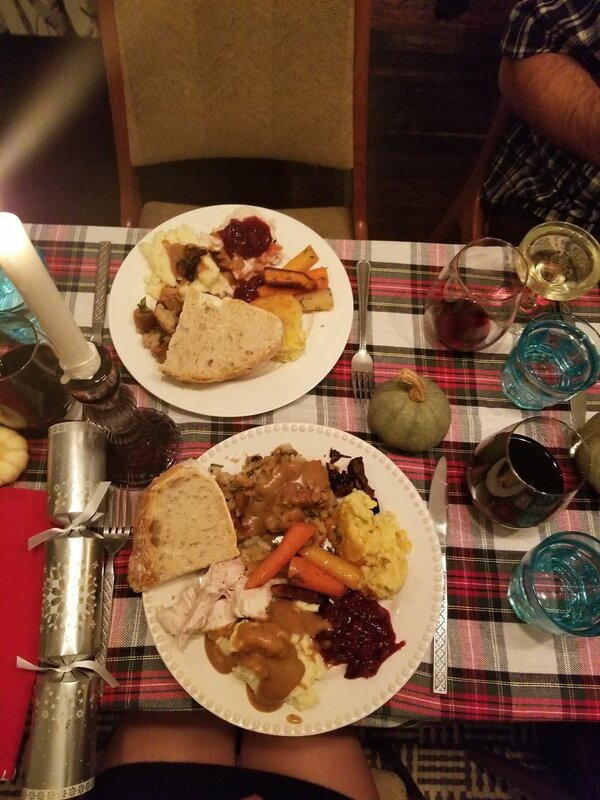 I remember our first Thanksgiving in our first apartment in Toronto - we used the coffee table as the dining room table since we didn’t have one LOL! The following year I hosted Thanksgiving dinner for a few “first timers” - a lovely couple from Chile and our dear Croatian friend Marina were our guests. That was shortly after purchasing our gorgeous wood dining room table that we still use today. 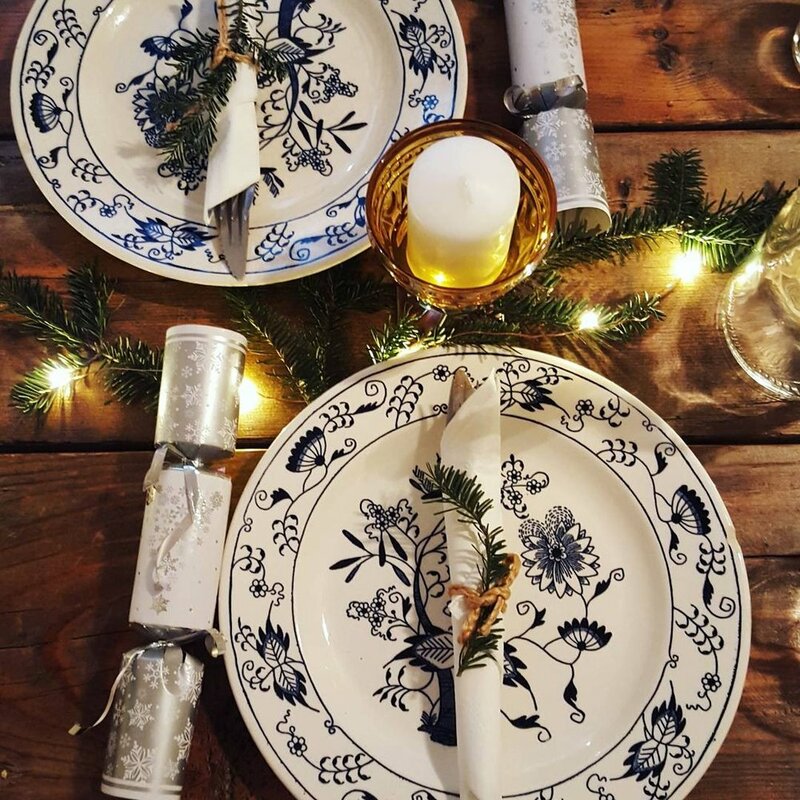 I still love those simple blue and white plates that were my Great Uncle Pete’s. Holiday “Crackers” or Poppers are a family tradition of mine, does your family have them? I enjoy forcing everyone around the table to wear their paper crowns. Thanksgiving 2017 was our first in our new town and new house- and we were lucky to have our dear friends fly in to celebrate. I just stumbled upon my menu from last year, but I’ll post that later. Looking at these photos of my tablescape from last year, it’s funny how fast design, taste and style evolve over time. This year, I’m torn between inviting over some new friends or just keeping it more casual and cozy with just my honey and our pup. The latter does sound surprisingly appealing - we are both exhausted and still blaming it on our wedding? Who knows, but that’s my excuse and I’m sticking to it. The earlier Canadian Thanksgiving also allows for me to get very excited for Christmas, very early. Here’s a picture of our small tree (hopefully last small live tree!! Can’t wait for the full size this year!) from last year, and a glimpse of the orange walls (that are no longer orange) of my office.